Martin Luther King, Jr. was born on January 15, 1929, in Atlanta, Georgia. King, both a Baptist minister and civil-rights activist, had a seismic impact on race relations in the United States. In 1963, he led the historic March on Washington, D.C., with more than 200,000 peaceful participants; then on the steps of the Lincoln Memorial, King delivered his famous, "I Have a Dream speech, the oration that would forever link him with the non-violent activism that would change the world. Through his moving orations and his non-violent activism, King helped bring an end to the legal segregation ofAfrican-American citizens in the South and other areas of the nation. His role in the creation of the Civil Rights Act of 1964 and the Voting Rights Act of 1965 earned him the Nobel Peace Prize in 1964. Tragically, he was assassinated in Memphis on April 4, 1968, but Dr. Martin Luther King, Jr. is remembered to this day as one of the greatest American social and spiritual leaders in our nation's history. Meticulously designed, this set of three remarkable coins celebrates Dr. King on the 50th Anniversary of his famous "I Have a Dream speech. 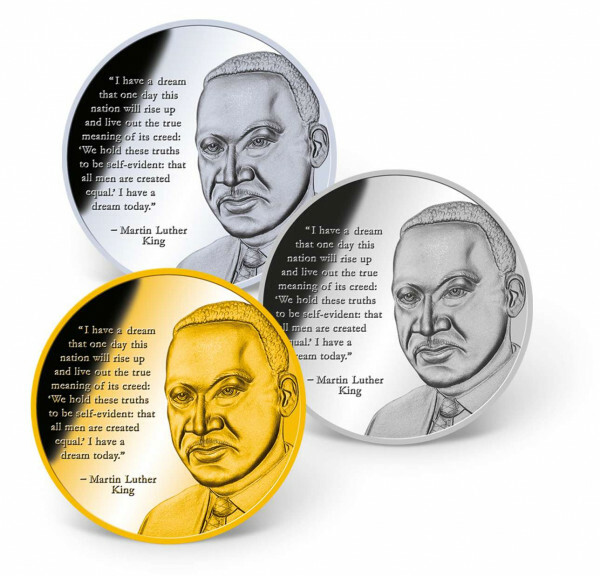 Each coin features a highly detailed image of Dr. King with an excerpt from the historic speech on the obverse and is exquisitely layered in a precious metal: one in 24k gold, one in .999 pure silver, and one in pure platinum! These coins are minted to the highest quality "Proof  standard and come in a beautiful wooden collector box, custom crafted to preserve and display your precious coins for generations to come - a true collector's item.